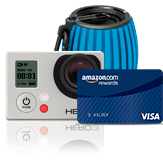 If you have an Amazon.com Rewards Visa card, now might be the time to go shopping - they're currently offering 20% off purchases of a large list of "select" electronics, with a maximum total discount of $50. There is no maximum number of items you may use the discount on, but you can only use it on a single Amazon order - then it's gone. The promo code is TCH20ARC.